Camille Fronk Olson is a professor of ancient scripture at Brigham Young University, where she also chairs the Department of Ancient Scripture. Olson was born and reared in Tremonton, Utah. She earned her bachelor’s degree in education from Utah State University, her master’s in ancient Near Eastern studies and her PhD in the sociology of the Middle East, both from BYU. Her dissertation focused on Palestinian families in the West Bank and the Gaza Strip. After she completed her education, she taught full time as a Seminary teacher at a time when such positions were held primarily by men. She then joined the faculty of LDS Business College, eventually serving as the dean of students. She became the first full-time faculty member in the Department of Ancient Scripture at BYU. 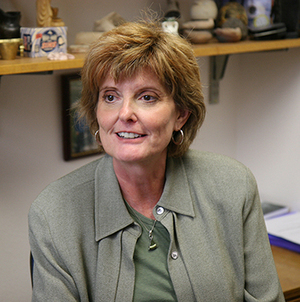 Prior to her assignment as department chair, she was the department associate chair. She also has taught at the Jerusalem Center for Near Eastern Studies. Olson is a member of The Church of Jesus Christ of Latter-day Saints. She served as a full-time missionary in Toulouse, France. She has served on the Young Women General Board and on the Church's Teacher Development Curriculum Committee. She is a popular speaker and writer whose published books include Women of the Old Testament; In the Hands of the Potter; Mary, Martha and Me; Lessons from Eve; and Too Much to Carry Alone. She co-authored (with Robert L. Millet, Brent L. Top, and Andrew C. Skinner) Belief: A Doctrinal Reference. She also co-authored With Healing In His Wings (with Thomas A. Wayment). She is also one of the contributors to Do Not Attempt in Heels: Mission Stories and Advice From Women Who Have Been There. She has been a contributing scholar on BYUtv productions. She and her husband, Paul, reside in Provo, Utah. This page was last edited on 30 June 2015, at 09:30.